Just like with these awesome Del Sol sunglasses that I wrote about recently I was lucky enough to get a pair of Color-Changing Nail Polishes by Del Sol that do the same thing-change color when the sun hits.mI've been big on getting mani pedis monthly because I live in the land of endless summer so it's cool to be able to have a different set of polish during the day and at night. Just like the sunglasses, once I get back indoors the sun-kissed color lasts a long time so anyone paying attention really notices the difference. 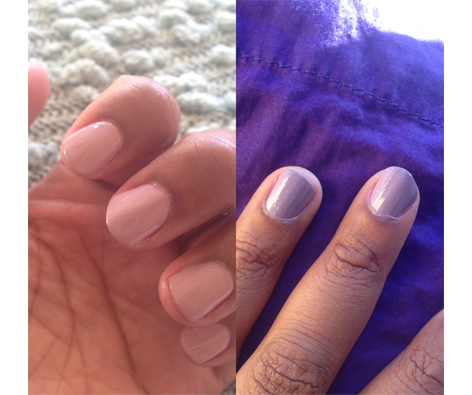 Out of the two colors that I received Calm & Cool are my favorite ones. It's a nice shade of lilac when you first apply it but becomes a nice grape shade when the sun hits it. This nail polish is 5-Free and is never tested on animals. When I got this polish it wasn't too thin or thick and I only had to apply two coats in order to cover my nails entirely. I normally give nails tons of try to dry because I'm notorious for ruining my nails easy but I didn't really check the time on these. However they were fully dry within 10 minutes when I decided to actually use my hands. These are pretty cool and just like the sunglasses Del Sol is letting me share the love and give one or two of these away. So check out their line of polishes and let me know which one you'd love to rock indoors and outdoors!